The overall purpose of this resource is to provide teachers with an engaging and fun way to keep track of upcoming events, meetings, etc. This resource is intended to help teachers reduce the stress in their lives by providing them with resources that are inspirational, motivational, and perhaps even funny. Each calendar contains a few inspirational quotes, some trivia, some fun facts about each month, and a unique celebration for each day. Choose the calendar you want to use, print it off, and be inspired and amused! 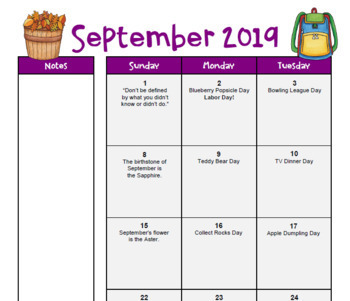 These monthly calendars also can be sent to parents for upcoming events and classroom activities. The possibilities for these are really endless! July 2019 thru June 2020 You will not have to purchase this resource again! You will receive updated calendars for a lifetime! New calendars will be added each year in May and will be for the months of July thru June. Buy Once- Free for Life! Inspirational Quotes- Each calendar includes 2-3 inspirational, motivational, and/or funny quotes. 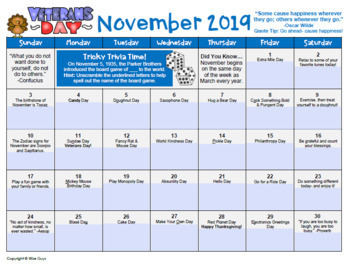 Monthly Tricky Trivia- Each calendar contains at least one “Tricky Trivia Time!” where you or your students have to figure out the answer to a trivia question. A separate answer key is provided. Monthly Fun Facts- Each calendar includes interesting facts such as the flower of the month, history, or other facts. Unique Daily Celebrations- Each month also contains unique National or International Celebration Days. For the most part, the special days represent celebrations in the United States, with that said, if you know a little about editing using Adobe Acrobat DC you will be able to edit the celebrations to fit your needs. Student/Family/Teacher PDF Calendars- These calendars (landscape) can be used for students, families, or teachers. They are saved in PDF, which means that if events are needed to be added, they will need to be hand-written. 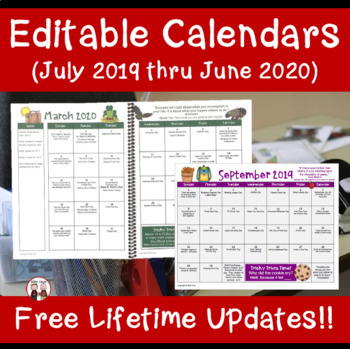 Student/Family/Teacher Editable PDF Calendars- These calendars (landscape) can be used for students, families, or teachers. These editable calendars can be typed in, saved, and printed off if you have Adobe Acrobat DC. Make sure that you have the most updated version of Adobe Acrobat DC. When you're ready to save, click FILE → SAVE AS → rename it → SAVE. Note: If you do not have Adobe Acrobat DC (only Adobe), these editable calendars can be typed in and printed off but just not saved. DO NOT open up the calendar using the Chrome version of PDF. Chrome will not allow you to print off what you typed. 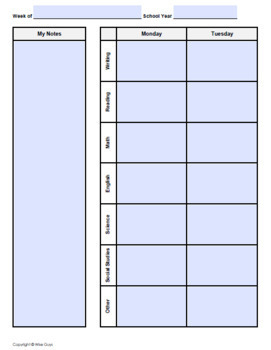 Student/Family/Teacher Editable Word Calendars- These calendars (landscape) can be used for students, families, or teachers. The clip art has been removed and the font is Arial. Students or teachers can type in each cell of the calendar using Microsoft Word. Teacher Binder PDF Calendars- These calendars (portrait) are intended to be used by teachers. They are saved in PDF, which means that if events are needed to be added, they will need to be hand-written. Teacher Editable Binder PDF Calendars- These calendars (portrait) are intended to be used by teachers. These editable calendars can be typed in, saved, and printed off if you have Adobe Acrobat DC. Make sure that you have the most updated version of Adobe Acrobat DC. When you're ready to save, click FILE → SAVE AS → rename it → SAVE. Note: If you do not have Adobe Acrobat DC (only Adobe), these editable calendars can be typed in and printed off but just not saved. DO NOT open up the calendar using the Chrome version of PDF. Chrome will not allow you to print off what you typed. Teacher Editable Binder Word Calendars- These calendars (portrait) are intended to be used by teachers. The clip art has been removed and the font is Arial. Teachers can type in each cell of the calendar using Microsoft Word. Student/Family/Teacher Black & White PDF Calendars- These calendars (portrait) can be used for students, families, or teachers. They are saved in PDF, which means that if events are needed to be added, they will need to be hand-written. These can be printed on colored paper. Student/Family/Teacher Editable Black & White PDF Calendars- These calendars (portrait) can be used for students, families, or teachers. These editable calendars can be typed in, saved, and printed off if you have Adobe Acrobat DC. Make sure that you have the most updated version of Adobe Acrobat DC. When you're ready to save, click FILE → SAVE AS → rename it → SAVE. Note: If you do not have Adobe Acrobat DC (only Adobe), these editable calendars can be typed in and printed off but just not saved. DO NOT open up the calendar using the Chrome version of PDF. Chrome will not allow you to print off what you typed. These can be printed on colored paper. Student/Family/Teacher Editable Black & White Word Calendars- These calendars (portrait) can be used for students, families, or teachers. The clip art has been removed and the font is Arial. Students or teachers can type in each cell of the calendar using Microsoft Word. These can be printed on colored paper. Weekly Planners- Also included are editable Word and PDF and non-editable weekly lesson planner templates.